Redefining the definition of "Show"
Together at last! RandomK(e) and The Contractors offer you an evening of post-rock, performance art rock, and something else, we're not sure what. RandomK(e) draws on disparate influences to produce original music that ranges from soundscapes and noise exploration to space rock, deep dub and even conventional pop structures. Founded in late 2004, the group continues to chart new musical territory and will record its debut album for the SubJam label in 2007. 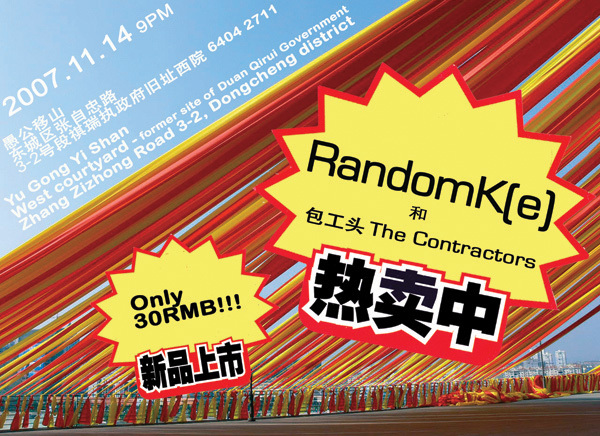 The Contractors is a Beijing based conceptual art band comprised of artists/writers/curators/construction workers. The group has organized interventions in printed magazines, art fairs and performance festivals, performed in nightclubs and have a hand in the fabrication of high-rise skyscrapers and highway overpasses. They accept most bribes.